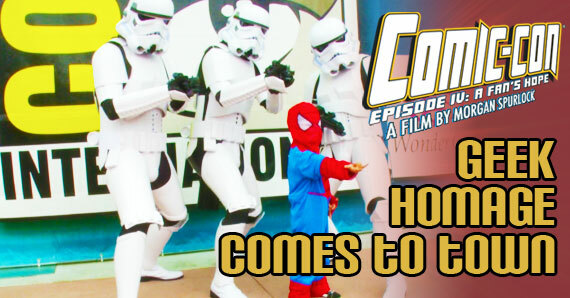 If you are a fan of Ewoks, comic books, Stan Lee and/or all things pop culture, then you must be excited to see Morgan Spurlock’s newest movie, Comic Con Episode IV: A Fan’s Hope. This documentary gives the audience an inside look at what goes on during pop culture’s biggest convention of the year – Comic Con, San Diego. The camera follows the lives of 5 attendees as they descend on the ultimate geek mecca at 2010’s San Diego Comic Con. In a surprising move, Comic Con Episode IV: A Fan’s Hope will also be available through your favorite On-Demand provider starting April 6th! Bring Comic Con To Your Town! Did we mention that Morgan Spurlock will also be hosting a Q&A in the towns? So if any fans out there wanna see the Comic Con documentary come to their town, here’s what you need to do. Go to the movie’s website comicconmovie.com and click on “Bring Comic Con To Your Town!” Once you get there, share the events on your Facebook, Twitter, Tumblr, Google +, or simply pass the information to your friends and their friends and reserve your tickets! It’s that simple. This movie is the first of its kind to get an inside look at what goes on during San Diego’s Comic Con. Screenings begin in less than a week, so get moving! Tell your moms, dads, friends and Ewoks to start spreading the word and bring Comic Con to a town near you! This entry was posted in Documentary, The MG Blog and tagged Comic Con, Documentary, Film, Morgan Spurlock, movie, Screening by arianned. Bookmark the permalink.